I have been working with a lovely family who are finding it hard to adjust to the changes that blending two families together brings. I always remind my clients that bringing together 2 separate families is a process and not an event, and it takes time and flexibility on everyone’s behalf to settle into new family relationships. It’s about managing your expectations and keeping the lines of communication open. It’s also about building bridges not walls between each other and being patient. I wrote an article called ‘Cooking up a happy step family is like a slow burning casserole’ which you can read by clicking on the title. I have recently been asked to contribute my thoughts on the stages that families generally go through on BBC radio. So I hope this helps. Researchers have found that most stepfamilies go through predictable stages as they learn to live together as a family. By understanding these stages it can help you understand why you might feel the way you do now, and what to expect in the future, so that you can be better prepared and therefore better able to cope and be more effective at working through the process. A number of stages have been identified, with progression from one stage to the next depending on meeting the challenges of the previous stage and of course your family’s dynamics and personalities. Of course this is just a guide as all families adjust in their own speed and in their own time. This is where a couple meet and fall in love. Adults fantasise about rescuing each other, and the children, from perhaps their sad divorce and they perhaps may even protect their partner from their previous partner. But whilst the parent and new partner/stepmother fantasise that the children will welcome their new partner with open arms, the children often cling to the hope and dream that their parents will get back together or that the stepparent will simply just disappear. While this stage won’t last forever it’s an important and natural part of the stepfamily cycle. As time passes, the family members begin to get to know one another, and hopefully like one another, and then they move on to the next phase. But don’t rush anyone through the process – think of it more like a slow burning casserole than a food mixer blending everyone into The Brady Bunch! This stage begins once the new partner has become familiar, even accepted, but they still may feel an outsider in many ways. Often they feel left out of the family unit or even rejected by the stepchildren, which can lead to resentment, confusion and anger. They may take a step back and withdraw from family life emotionally a little in an effort to somehow protect themselves from further hurt or rejection which may in turn be interpreted as a lack of desire to be part of the family by their partner. So this is the time to talk to your partner about how you are feeling. This is often the time when the stepparent can start to feel trapped in a ‘no win’ situation but once you start to recognise these feelings and want things to change, you’re ready to move onto the next stage of process. This is the point at which you know there needs to be changes but you’re not sure what to do for the best. 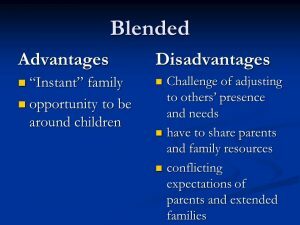 You may find that you’ve identified the problems within your blended family – but you don’t know how to fix them. Often this is the stage at which stepmums start to look for help, maybe from others in the same position or from articles or books or online. It’s the time when you need both reassurance that your feelings are ‘normal’ and help in addressing the issues causing problems in your family. This is a good time to start being honest and open with your partner and to begin talking to them about the way you feel and the changes you want to happen in your family. This is a good opportunity to begin to become a more equal partner and member of the family. During this stage there’s lots of negotiation and often a bit of conflict but it’s really important to talk through the issues if the family is to really move forward and integrate. The common problems of discipline, bedtimes, computer use, co-parenting with your old partner, & your financial ways of doing things can all add more tension into the mix. Once you’ve shared your feelings and opened up about the problems you are experiencing it’s important that you work together to sort them out. This is where I can help, as sometimes you can’t see the word for the trees. So we look at your house rules, your styles of discipline, your values, your expectations and your ways of doing things as you start to take decisions together and take more solid steps towards becoming a more integrated, happier family unit. This process will take time. It’s likely that the issues were percolating some time before you recognised the problem so it will take time for the feelings of isolation, hurt, anger or jealousy to subside. So you need to be patient and keep working together with your partner. This is the point where the stepfamily have learnt to deal with any problems they had between them. They feel more confident and able to cope with whatever life throws at them. Your stepfamily will have now developed its own traditions, rules and rituals that define it uniquely and your relationships with each other are now more solid and reliable. Although these stages may appear ‘cut and dried’, they usually merge into one another without your family being aware of the change. It’s only with the benefit of hindsight that you actually notice the changes that have happened in your relationships. Some families take longer than others to move through the stages and although there is no hard and fast rule, it’s typical for a family to take several years to progress to the final phase. I always say it’s a marathon not a sprint so don’t beat yourself up if you get stuck in one phase or stage. Life is messy and untidy and doesn’t happen in straight lines. A thriving marriage isn’t instant. It requires two people working together in an environment of love, support and mutual respect. Take your time, be patient and remember a curve is a smile that puts a lot of things straight. The post Understanding The Stepfamily Cycle. appeared first on Sue Atkins The Parenting Coach.